Not true. Imagine what would happen if one of your tyres failed to work at 70mph. Anything that keeps tyres in tip-top condition is worth every penny or second of your time. Taking a good look at both tyres when you lube the chain is an easy way of maintaining their health. If slicks are so good for racing why do road tyres have tread? Tread patterns or tread cuts are there for one purpose and it’s to do with rain. The tread pattern/shape is designed to move as much surface water away from the tyre’s contact patch with the road – no contact means no grip. High performance sticky tyres have minimal tread just for legality purposes, and most don’t have tread at the edges for stability reasons. Why are bike tyres more expensive than car tyres? While we might think tyres are just black rubber hoops, there’s a lot more to it than that. The make-up of the tyre compound consists of many things like rubber, carbon black, silica etc. Then there’s the stuff you can’t see, like the internal carcass construction of Kevlar, nylon and steel plies. It costs a lot of money to design and manufacture a bike tyre – and we’re paying for that. 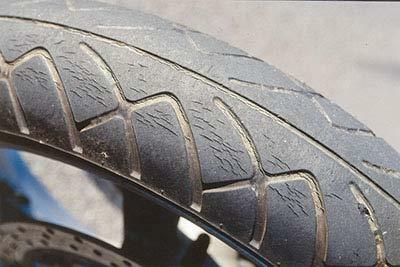 Is there such a thing as a grippy, long lasting tyre? 1. 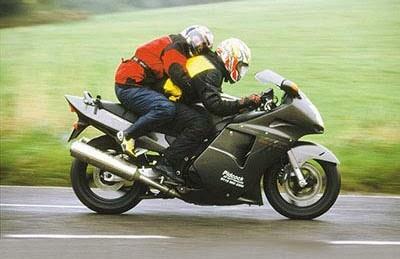 Correct tyre pressure is absolutely vital to ensure tyre life. Too low causes tyre flex and overheating that can damage the tyre’s internal construction. Over-inflation causes uneven wear; ie the centreline wears quickly, and can cause instability, as the tyre can’t soak up bumps or debris. Check pressures once a week. 3. 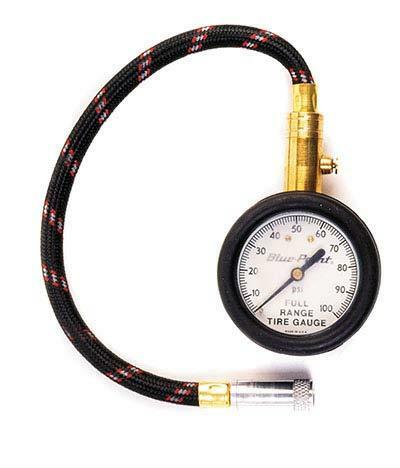 Quality gauges are expensive but then they can be recalibrated by certified technicians. Digital electronic gauges are perhaps the best gauges available because they’re basically foolproof to work with and can be carried around in the bike’s toolkit. As a rule the better known the brand of gauge the better the quality. 4. You can’t always see what lies ahead particularly if it’s small (eg nails) and it’s hard to distinguish between hitting a small piece of debris or a bump. Regular close inspection of a tyre is important, as cuts weaken the tyre’s construction and may be deeper than you think. Nails aren’t always found until the tyre goes down. 5. 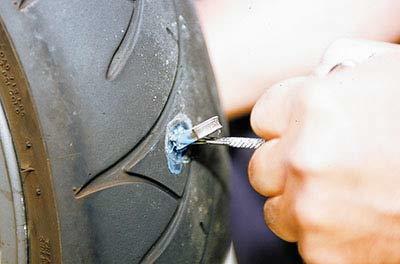 Carrying a pillion or luggage can lead to tyre damage. Refer to the owner’s manual for correct tyre pressures with a load. If this isn’t available, a good tip is to add 3psi to both tyres until the correct figure can be obtained from your dealer. Trackday pressures are not recommended for the road. 6. Buying a secondhand bike is stressful, and worrying about the condition of the engine can mean missing out on other areas – tyres are arguably as important as the motor. Check the tyres are in good nick, especially on older bikes with original tyres – tyres perish if left in sunlight or if they have come into contact with fuel or oil. 8. …Reduced as heat can weaken the repair. 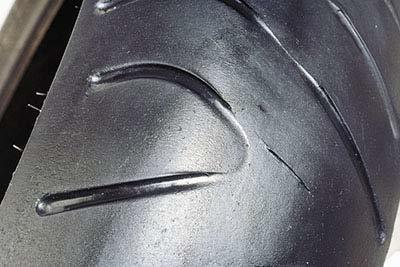 Repairs should not be carried out to tyres of over speed rating ‘Z’ (149mph – most 600cc bikes and above) – how would you feel if your secondhand GSX-R’s unknown repair blew out at that speed? Larger holes shouldn’t be repaired as the inner carcass is more likely to have been damaged. 9. 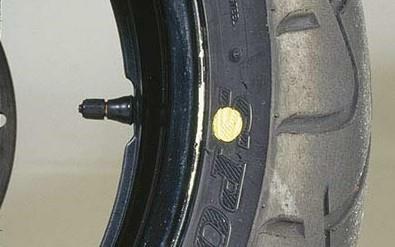 A leaking (Schrader) tyre valve core – detected by placing spit on top of the valve to see if it bubbles up – can be cured by tightening the core with a valve key (above left). Replace the core or valve if it still leaks after tightening. Also note that hot air expands, so the core might only leak when the tyre is hot and the air pressure within has grown. 10. 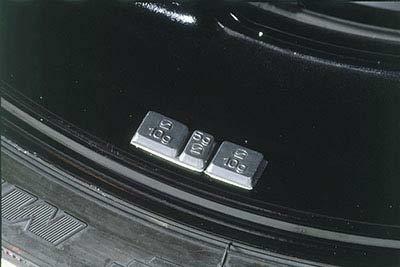 Valve caps are important to retaining air inside a tyre – any flash, gimmicky caps that don’t have a rubber-sealing ring inside them should be thrown away. Why? The seal prevents dust from entering the valve core, causing it to stick. It might also stop all the air from escaping in one hit if the valve core works loose. 11. Although tyres are made to exacting standards, there is always an imbalance between a new tyre and the rim. 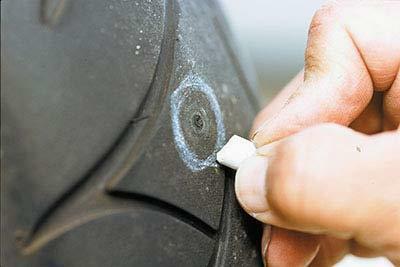 An unbalanced tyre will cause vibration and accelerate tyre wear. Balancing by use of weights is best left to dynamic machine balancers as they can detect exactly which part of the rim needs added weight. 12. Tyre tread depth should be at least 2mm (1mm minimum) over the tyre’s circumference across at least three quarters of the width of the tread. 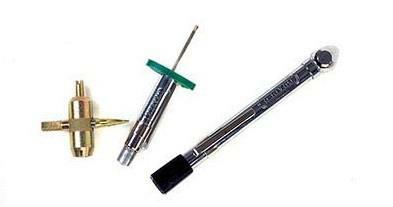 You can buy specialist tread depth measuring tools (above centre) at car accessory shops. Anything less then 2mm and you are asking for trouble in the wet. Finally air pressure should be measured and altered with a cold tyre – warm tyres are full of hot (expanded) air and give false readings. So how do you like yours?